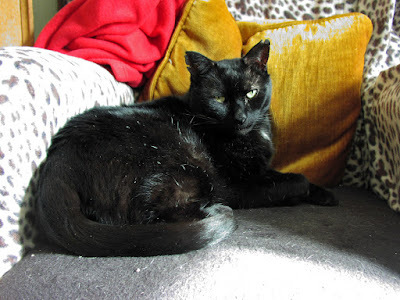 Please can I ask people to light a candle and send get well wishes to my cat Pharaoh. He has been given 50/50 chance of surviving by the vet this morning. Yesterday, when I was getting my things ready for my candle magic workshop at Treadwells, I noticed Pharaoh trying to wee where he shouldn't. That is very unusual as he is normally good about using his litter tray. When I cleaned it up, I discovered that he had passed blood. I rushed him to the vets where he is being kept in. The vet says he has a blockage in his bladder. He has treated the cat and hoped the bleeding would stop by this morning, but it hasn't. At the moment, he said Pharaoh has an even chance of recovering, but the longer this goes on the less likely that becomes. So today is really important. I will be doing candle magic and sending healing energy his way - and I would be very grateful if others would do the same. So sorry to hear this , I hope everything goes well. So sorry to hear of his illness and I hope he recovers! So sorry to hear this. Will light a candle and say a prayer. Sending healing thoughts. What a beautiful boy! Sending him lots of love and healing energy. Thanks to everyone for your help, healing wishes. Sadly Pharaoh passed on in the night. May the candles lit for him guide him safely to the Summerlands.